Το Αντίβαρο σας παρουσιάζει ολόκληρη την Συνθήκη Ειρήνης Βουκουρεστίου το 1913. Αυτή για την οποία μας έχουν πρήξει τα συκώτια ότι δήθεν «μοίρασε την Μακεδονία σε τρία (ή τέσσερα) κράτη, με την Ελλάδα να έχει το 51%, την Γιουσκοσλαβία το 38%, την Βουλγαρία το 10% και την Αλβανία λιγότερο από το 1%». Το λέει ο (τέως) υπουργός εξωτερικών Νίκος Κοτζιάς, το λέει ο πρωθυπουργός Αλέξης Τσίπρας (μαζί με την Μπακογιάννη και τον Μπουτάρη), το λέει ο Τζανακόπουλος, το λένε υπουργοί του ΣΥΡΙΖΑ (εδώ και εδώ), το λέει ο Ριζοσπάστης, το λέει ο 902, o Μπογιόπουλος, το λέει το ΚΚΕ στα φυλλάδια που μοιράζει στα σχολεία (φωτο 1, φωτο 2, φωτο 3), το λέει η Εφημερίδα των Συντακτών, to Documento, το λέει ο Μαυρίδης του liberal.gr, το λέει η Καθημερινή (ως εφημερίδα), το γράφει σε blog του Πρώτου Θέματος, το λένε καθηγητές πανεπιστημίου (στην Αυγή, στο Στο Κόκκινο, στο Κουτί της Πανδώρας), το γράφουν στα ελληνικά πανεπιστήμια (Μάστερ στο Παν. Μακεδονίας), το λέει η εγγονή του Τίτο, διάφοροι (εδώ, εδώ, εδώ, εδώ, εδώ). Το λέει εμμέσως και ο υπ. εξ. των Σκοπίων Δημητρώφ. Το λένε λίγο-πολύ όλοι. Ο ίδιος ακριβώς χάρτης υπάρχει και στην διεθνή έκδοση της Wikipedia για την εν λόγω συνθήκη. Ολόκληρη η Συνθήκη του Βουκουρεστίου στα αγγλικά [Αντιγραφή από site Σκοπιανών] με παραπομπές στους επίσημους χάρτες της Συνθήκης. Between these two extreme points the frontier line shall follow the line indicated on the I/ 100,000 and I/200,000 maps of the Roumanian General Staff, and according to the description annexed to the present article. 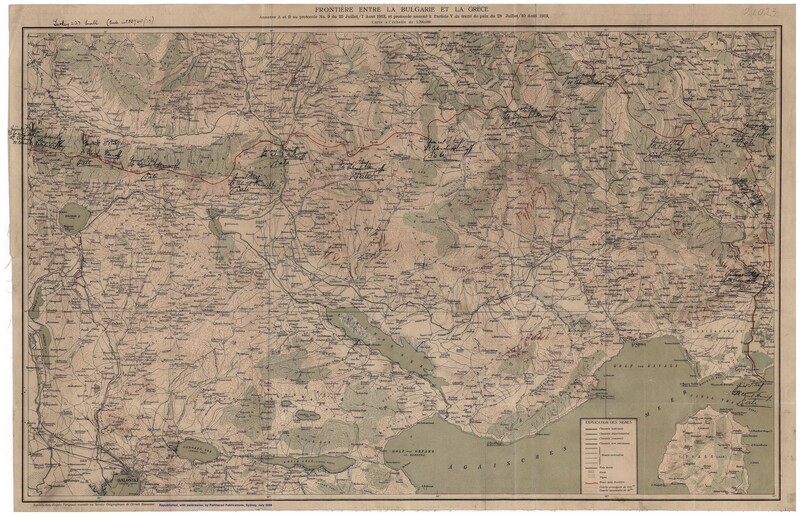 The frontier line shall begin at the old frontier, from the summit of Patarica, follow the old Turco-Bulgarian frontier and the dividing line of the waters between the Vardar and the Struma, with the exception of the upper valley of the Strumitza, which shall remain Serbian territory; the line shall terminate at the Belasica Mountain, where it will bend back to the Greco-Bulgarian frontier. 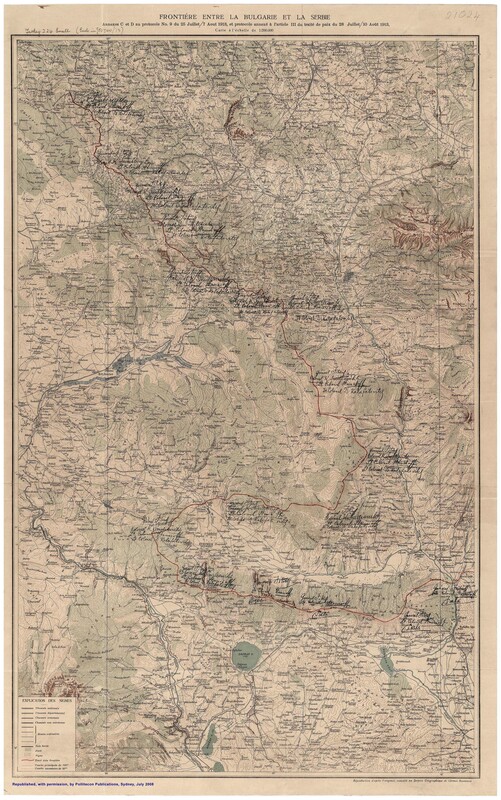 A detailed description of this frontier and the I/200,000 map of the Austrian General Staff, on which it is indicated, are annexed to the present article. A mixed commission, composed of an equal number of representatives of each of the two High Contracting Powers, shall be charged, within fifteen days from the signing of the present treaty, with delimiting the new frontier, in conformity with the preceding stipulation. This commission shall supervise the division of the lands and funds, which up to the present time may have belonged in common to the districts, communes, or communities separated by the new frontier. In case of disagreement as to the line or as to the method of marking it, the two High Contracting Parties agree to request a friendly Government to appoint an arbitrator, whose decision upon the points at issue shall be considered final. The frontier line shall start from the new Serbo-Bulgarian frontier on the summit of Belasica Planina and terminate at the mouth of the Mesta on the Aegean Sea. A mixed commission, composed of an equal number of representatives of each of the two High Contracting Parties, shall be charged, within fifteen days from the signing of the present treaty, with delimiting the frontier in conformity with the preceding stipulations. This commission shall supervise the division of the lands and funds, which up to the present time may have belonged in common to the districts, communes, or communities separated by the new frontier. In case of disagreement as to the line or as to the method of marking it, the two High Contracting Parties engage to request a friendly Government to appoint an arbitrator, whose decision upon the points at issue shall be considered final. The headquarters of the respective armies shall be immediately informed of the signing of the present treaty. The Bulgarian Government engages to begin to reduce its army to a peace footing on the day after such notification. It shall order its troops to their garrisons, whence, with the least possible delay, the various reserves shall be returned to their homes. If the garrison of any troops is situated in the zone occupied by the army of one of the High Contracting Parties, such troops shall be ordered to some other point in the old Bulgarian territory and may not return to their regular garrisons until after the evacuation of the above- mentioned occupied zone. VII. The evacuation of Bulgarian territory, both old and new, shall begin immediately after the demobilization of the Bulgarian army and shall be completed within a period of not more than fifteen days. During this period the zone of demarcation for the Roumanian army of operations shall be determined by a line running as follows: Sistov-Lovcea-Turski-Isvor-Glozene-Zlatitza- Mirkovo-Araba-Konak-Orchania-Mezdra-Vratza-Berkovitza-Lom-Danube. Such armies shall have free use of the railways for the transportation of troops and of provisions of all kinds, without compensation to the local authority. The sick and wounded shall be under the protection of the said armies. The ratifications were exchanged August 30, 1913. PROTOCOL appended to Article II of the Treaty of Bucharest of 28th July (10th August), 1913. The route of the border as marked on the map at 1:200,000 follows the lines or points that are characteristic of the ground, such as: valleys, dells, peaks, saddles, etc. Between the villages, it follows the centre of the intervening space following, as much as possible, the natural lines. The general route starts from the Danube at the level of the intervening space separating the two islands located to the north-east of the Iezer Kalimok. On leaving the Danube to follow the route of the border to the Black Sea, this route is first marked by the base of the terrace of the left bank of the valley separating the villages of Turk Smil and Kiutiukli. It then goes up the spur located to the north of the path from Kiutiukli to Senovo, crosses the central hillock (there are three) located to the west of the village of Senovo; skirts the beginning of the two dells located to the south of the village of Senovo, descends to the opening of the dell located to the west of the village of Kazeilar, which it follows almost to its beginning; It then crosses the valley of Hadjifaklar and the plateau alongside the road from Kazeilar to Balbunar. Between this road and the hill 209, it crosses the valleys to the west and east of Kuvanojilar between which it skirts, following the crest, the central dells of the same valleys of Kuvanojilar. From the south of hill 209 , it goes toward the central bend of the Demir-Babinar river to the east of the village of Seremetkioi, which it reaches after having crossed the hillocks located to the south-west of 209 and after having followed the dells and the confluences closest to the straight line joining 209 to the hill 226 (north of Seremetkioi). To the east of Demir-Babinar, the route of the border follows the spur located between Kiuseabdt Kasapla and Eski Balabanlar, first crosses the valley, then the plateau located to the east of this valley, between the villages of Atkioi and Saladinkioi, it then descends into the valley of Saormankioi at the confluence of the small dell of Saladinkio. The route then crosses the hillock located to the north of the village of Kaidarkioi (on the road to Silistrie), adjoins the confluence of the dell located to the north of the village of Juklii to reach the road from Schoumia to Silistrie, at the south of hill 269 after having skirted to the west, south and east of the village of Rahman Asiclar, passing by the confluences or by the depressions best located to fix this route at almost equal distance from the villages that the border separates in this region. From 269 the route passes between Dorutlar and Cioban Nasuf; descends to the confluences of the first two dells located to the east of the village of Cioban Nasuf, follows the spur flanked by these two dells, still running toward the south-east following the thalweg of the dell starting in the river Reonagol to the north-west of Mahmuzlai. It then descends to the course of this river up to the confluence located to the north-west of the dell of Mahmuzlai, which it then goes up to pass to the south of the hillock 260 (saddle), from which it descends into the dell of Kiuciuk Ahmed at the junction of the roads. After having gone along the course of this river a little, the route of the border goes up the spur located between KiuCiuk Ahmed and Killi-Kadai, crosses the hillock 260, rejoins the confluence of the two dells located to the west of Ekisce, goes up the dell located to the west of this village, changes direction toward the south, crosses hillock 277 and the saddle of the hillocks located between the villages of Vladimirov and Gekcidelink; it crosses the saddle located between the villages of Gekcidelink and Kapudjimah again, from where it goes firstly toward the north and then toward the east following the depression that passes to the north of Kortut (Korkut). Between Kortut and the Isikli stream, the route of the border follows the water catchment divide to the south of the village of Kadikioi and the hill 303 up to the major bend at Isikli. In the following section, which ends on the road from Varna to Dobrici, the border first follows the course of the valley of Kumbudja, then the eastern branch of this valley, passing to the north of the hillock 340. The last section of the route of the border located between the Varna-Dobrici road and the Black Sea crosses the dell of Kuiudjuk at its outset, follows a small spur, then a dell in the south-east direction, it then curves toward the north-east in the direction of the hill 299 following a water catchment divide; it then separates, by lines that are characteristic of the terrain, the villages of Ciauskioi and Kapaklii, after having, in the same way, separated Mustafa Beiler from Vlahlar; It finally reaches the Black Sea by crossing the saddle located to the south of hill 252. The route of the border thus defined topographically using the existing cartographic documents (maps of 1:200,000, 1:126,000 and 1:100,000) is also plotted to certain remarkable points on the ground. To this effect, the trigonometric points of the existing triangulation were chosen first, followed by the steeples of churches or the minarets in the villages. This is why this route was included in a triangulation developed between the Danube and the Black Sea. As the triangulation cuts the route of the border, the intersections are marked at invariable points on the ground, whose distance can be measured with an approximation of 50 metres. This is how the point of departure of the border from the Danube is plotted to the hill of the trigonometric point of Turtucala which is at a distance of 15 kilometres. In the same way, the distances of all the hillocks, saddles, etc, which form the landmarks of the border, can be read from the map. Signed in Bucharest, on 28th July (10th August) 1913. Detailed description of the new Bulgaro-Serbian border. The line of the border starts to the north of the old Bulgaro-Serbian border, from Patarica point, follows the old Bulgaro-Turkish border up to Dixderica, then follows the water catchment divide between the Vardar and the Strouma passing by Lukov vrh (1297), Obel. Poljana, the hill 1458, hill 1495, Zanoga (1415), Ponorica, Kadica, hill 1900, hill 1453, Cingane Kalessi, the crest of Klepalo, hill 1530, the crest of Males planina (1445), turns to the west toward hills 1514 and 1300, passes by the crest of Draganeva dag, Kadi mesar tepesi, Kale tepesi, crosses the river Novicanska to the south of the village of Rajanci, passes between the villages of Oslovci and Susevo, crosses the river Stroumica between Radicevo and Vladovic and goes up toward hill 850, again follows the water catchment divide between the Vardar and the Strouma by hills 957, 571, 750, 895 and 850 and reaches the crest of the Belasica mountain, where it joins the Bulgaro-Greek border. 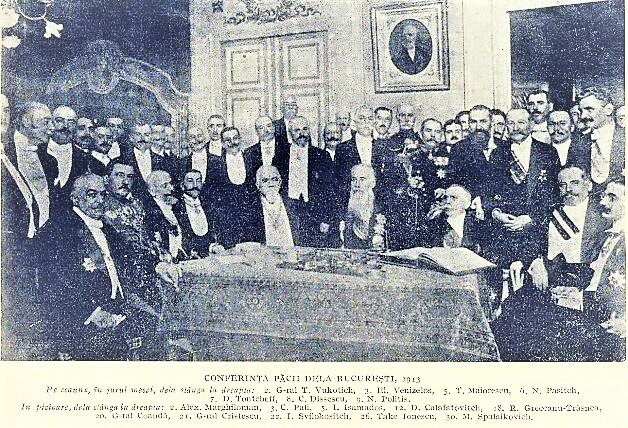 PROTOCOL appended to Article IV of the Treaty of Bucharest of 28th July (10th August) 1913, regarding the Questions in relation to the former Serbo-Bulgarian Border. A mixed Serbo-Bulgarian Commission, which will be established within a period of one year with effect from the date of ratification of the peace treaty, shall govern the questions in relation to the former Serbo-Bulgarian border, taking the thalweg of Timek as a principle, insofar as this river serves as the border between Serbia and Bulgaria, and the line from the summit of the heights of Batchichte to Ivanova Livada. At the latest within a period of three years with effect from the date of ratification of the peace treaty, the two contracting high parties shall be bound to mark the entire route of the former Serbo-Bulgarian border by permanent signs. All the existing Mills on Timok, as this serves as the border between Serbia and Bulgaria, shall be removed within a period of three years from the date of ratification of the peace treaty and henceforth no installation of this type shall be permitted on this part of the river. It is also understood that it will no longer henceforth be permissible for the subject of the two contracting high parties to own real estate divided by the border line (the property known as “dvodlassna”). As regards the ownerships of this type currently in existence, each of the two governments hereby undertake to proceed with the expropriation, by means of a just prior compensation fixed by the local procedure, of the parcels located on its side of the border. The same rule shall apply to the properties located in the enclave of Roglievo-Koilovo and in that of Halovo-Vregeogrotzi, their legal situation with regard to the citizens of the two neighbouring States having been settled by Protocol No. 11 of the mixed Serbo-Bulgarian Commission of 1912. The aforementioned expropriations shall be performed within the deadline of three years at the latest, with effect from the date of ratification of the peace treaty. The border line starts on the crest of the Belasica planina from the Bulgaro-Serbian border; follows this crest, then descends along the crest located to the north of Iurukleri and goes to the confluence of the Strouma and the Bistrica, goes up the Bistrica and then goes toward the east at Cengane Kalesi (1500). From there it reaches the crest of Ali Butus (hill 1650) and follows the line of the water catchment divide, between the hills 1820, 1800, 713 and Stragac. From there, still following the water catchment divide it goes toward the north and then toward the north-east, to follow the water catchment divide between the hills 715, 660 and reaches the hills 1150 and 1152, from where, by following the crest to the east of the village of Rakistan it crosses the Mesta, goes toward the summit of Rusa and Zeleza, crosses the Despat (Rana) suju and reaches Cuka. From this point it re-takes the water catchment divide and passes by Sibkova, Cadirkaya (1750), Avlika dag (1517), Kajin Cal (1811), Debikli (1587), descends toward the south at hill 985, to turn to the east at the south of the village of Karovo, from where it goes toward the east, passes to the north of the village of Kajbova, goes toward the north and passes by the hills, 1450, 1588, 1850 and 1845. From there it descends toward the south passing by Cigla (1750), Kuslar (2177). From Kuslar, the border line follows the water catchment divide of the Mesta and the Iassi Evren dere by Rujan pl. and reaches Achlat dagi (1300), follows the crest that goes toward the railway station at Okeilar (41) and from this point follows the course of the Mesta to end in the Aegean Sea. (No. 1.) – Mr. Maioresco, Minister of Foreign Affairs of Romania, to Mr. Tontcheff, First Delegate of the Royal Government of Bulgaria to the Conference of Bucharest. (No. 2) – Mr. Tontcheff, First Delegate of the Royal Government of Bulgaria to the Conference of Bucharest, to Mr. T. Maioresco, President of the Council, Minister of Foreign Affairs. (No. 3) – Mr. Maioresco, Minister of Foreign Affairs of Romania, to Mr. E. Veniselos, President of the Council of Ministers of Greece, First Delegate of the Royal Hellenic Government to the Conference of Bucharest. (No. 4) – Mr. E. K. Veniselos, First Delegate of the Royal Hellenic Government to the Conference of Bucharest, to Mr. T. Maioresco, President of the Council of Ministers, Minister for Foreign Affairs of Romania. (No. 5.) – Mr. Maioresco, Minister for Foreign Affairs of Romania, to Mr. N. Pachitch, President of the Council of Ministers of Serbia, First Delegate of the Royal Government of Serbia to the Conference of Bucharest. (No. 6.) Mr. Pachitch, First Delegate of the Royal Government of Serbia to the Conference of Bucharest, to Mr. T. Maioresco, President of the Council of Ministers, Minister for Foreign Affairs of Romania. Sources: Main Treaty Text: Major Peace Treaties of Modern History, 1648-1967, Vol. II, Editor Fred L Israel, New York: Chelsea House in association with McGraw Hill, 1967. Treaty Protocols: Based on French Version from Consolidated Treaty Series Volume 218, 1913, Parry, published by Oceana Publications Inc NIC, Dobbs Ferry, New York. This translation from the French was commissioned by Pollitecon Publications. Translation Copyright Pollitecon Publications. Permission to reprint granted when these Sources are acknowledged in full. Ανώνυμος 2 Δεκ 2018, 1:22:00 μ.μ. Πουθενά "Μακεδόνες" ! Μέχρι και οι Ασσυροχαλδαίοι έβγαλαν βουλευτή. 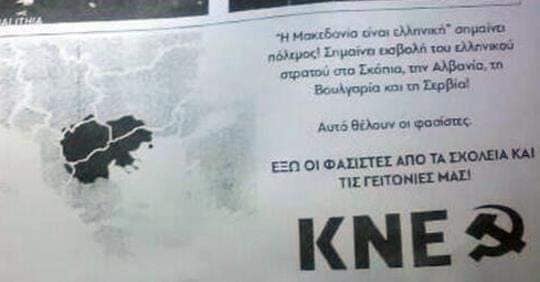 Εκεί που θα περιμέναμε "Μακεδόνες" ( σημερινά Σκόπια ), βλέπουμε "Βούλγαρους" . Αντωνιος Παρασκευοπουλος 3 Δεκ 2018, 9:36:00 π.μ.